Professor Wang's research interests are electroanalytical technologies, advanced materials for rechargeable batteries, fuel cells and supercapacitors. He has published over 220 papers in peer-reviewed journals including Science, Nature Energy, Nature Materials, Nature Nanotechnology, Nature Chemistry, and Nature Communications, Proceedings of the National Academy of Sciences, Journal of the American Chemical Society, Advanced Materials. His research has been cited more than 13000 times and has an H-index of 63 (ISI. 11/20/2018). In collaboration with ARL scientist, he achieved the scientific breakthrough in electrolyte materials with the invention of water-in-salt electrolytes for Li-ion batteries (Science 2015) and Zn-air batteries (Nature Materials, 2018), which opened an entirely new area of high voltage aqueous electrochemistry and batteries that never existed before, and has inspired many researchers to follow. As a follow-up of this ground-breaking technology, he is currently collaborating with Scientists in Safe, a world-leading Li-ion battery manufacturer, to demonstrate a 500 Wh aqueous battery pack for electric vehicle application. He also developed a fluorinated electrolyte to form LiF-rich solid-electrolyte-interphase (SEI) on anode and Cathode-electrolyte-interphase (CEI) on the high-voltage cathode to stabilize electrodes (Nature Nanotechnology, 2018). This new design philosophy of SEI sets the foundation for new battery chemistries for years to come. For more information about current research projects, please visit Professor Wang's web site. Professor Wang also advises the department's undergraduate Chem-E Car team, which took first place at the American Institute of Chemical Engineers’ (AIChE) mid-Atlantic Regional Conference's Chem-E Car Competition in 2011, and second place at the regional competition in 2012. L. Suo, O. Borodin, T. Gao, M. Olguin, J. Ho, X. Fan, C. Luo, C. Wang, K. Xu. Water-in-Salt Electrolyte Enables High Voltage Aqueous Li-ion Chemistries. Science, 2015, 350, 938. Perspective from Prof. Bruce Dunn. F. Wang, O. Borodin, T. Gao, X. Fan, W. Sun, F. Han, A. Faraone, J. Dura, K. Xu and C. Wang, Highly Reversible Zinc-Metal Anode for Aqueous Batteries, Nature Materials, 2018, 17, 543-549. X. Fan, L. Chen,† O. Borodin, X. Ji, J. Chen, S. Hou, T. Deng, J. Zheng, C. Yang, S. Liou, K. Amine, K. Xu, C. Wang, Non-flammable Electrolyte Enables Li-Metal Batteries with Aggressive Cathode Chemistries, Nature Nanotechnology, 2018, 13, 715-722. X. Fan, E. Hu, X. Ji, Y. Zhu, F. Han, S. Hwang, J. Liu, S. Bak, Z. Ma, T. Gao, S.-C. Liou, J. Bai, X.-Q. Yang, Y. Mo, K. Xu, D. Su, C Wang, High Energy-Density and Reversibility of Iron Fluoride Cathode Enabled Via an Intercalation-Extrusion Reaction, Nature Communications, 2018, 9, 2324. To download these papers in PDF format, please visit Professor Wang's web site. To view a complete list of Professor Wang's publications, citation metrics, and H-Index, please consult his entry on ResearcherID. Each awarded $25K to sponsor research. 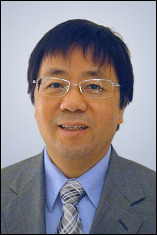 Hu, Wang demonstrated significant influence through publication of multiple highly cited papers during the last decade. Chemical engineers pack more energy in same space for reliable battery. Researchers have synthesized a new cathode material from iron fluoride that surpasses the capacity limits of traditional lithium-ion batteries. Han took third place in the annual Clark School competition. Researchers revive an old chemistry with a new electrolyte. Grant will fund research of carbon-neutral fuel with high energy density. Study conducted by University of Maryland Prof Chunsheng Wang and U.S. Army Research Lab Scientist Kang Xu's research groups, published in Joule. UMD ChBE researchers develop a cluster of azo materials for use in alkali-ion batteries. Corresponding research paper published in CHEM magazine. ChBE researchers develop self-healing battery chemistry. New battery created by Chunsheng Wang's group offers safety, durability and flexibility. UMERC confirms its role as a leader in energy research, development, and innovation. Chunsheng Wang's research group is developing a rechargeable magnesium/iodine battery for daily consumer use. Yifei Mo and team seek to improve all-solid-state Li-ion batteries. University of Maryland and US Army Research Lab researchers are spearheading a collaboration to develop a safer and less-costly lithium battery. Research on advanced batteries and a next generation electrochemical compressor recently garnered a set of awards for three University of Maryland graduate students in the Department of Chemical and Biomolecular Engineering. A team of researchers at UMD, ARL, and colleagues have developed a battery that is at once safer, cheaper, more environmentally friendly, and more powerful - by adding a pinch of salt. Collaboration between UMD, NIST, and ARL facilitated by seed grant from the Center for Research in Extreme Batteries. New research center expands scope and draws regional experts. New center cofounded by ChBE professor Chunsheng Wang. Chemical and Biomolecular Engineering graduate students receive inaugural awards. New process designed to make Na-ion batteries an effective alternative to Li-ion. Recent results from Wang, Zachariah featured in Nano Letters, C&EN. Grad student awarded top honors at Nanostructures for Electrical Energy Storage meeting. National Science Foundation supports C. Wang's efforts to create a single material for anode, electrolyte, and cathode. Work by grad student Yanting Luo, colleagues featured on cover of Macromolecular Chemistry and Physics. In breakthrough batteries, virally structured nano-electrodes boost energy capacity 10-fold. Student presents work on microfabricated energy storage devices made with biological templates. Wang, Guo create longer-lasting electrode using 3D polymer structure, silicon nanoparticles. Viruses used as structural template for lithium ion battery components. Six laboratories showcased in special tours. Research designed to increase effectiveness of lithium ion batteries. Award will fund development of electroanalytical techniques to make electric cars feasible. State of Maryland funds innovative fuel cell research.